The TOTO MS854114 is not just a single unit but a separate line of models that have much in common. Practically, the line offers a variety of features that can suit all any user in particular. To know more about the products and their features one should read through the following article. At first glance, it doesn’t differ from a regular toilet. Yet, if you look carefully, you’ll see that it comes with an elongated bowl, which provides more comfort in some situations. Though it sounds ridiculous, lots of men face difficulties with small units, as they require a precise aiming… The ‘sniper shot’ problem is solved with the Toto MS854114. It is not quite a topic for discussion, of course, but to avoid any unpleasant situation one should consider this fact. Also, the style plays a big part in attracting the customers’ attention. Toilets with separate parts cause additional difficulties for their owners, as there are more areas to be cleaned. Meanwhile, the one-piece unit is much easier to look for. There is no space between the base and the tank, the whole unit is a solid piece of vitreous china. The fewer amount of mold on your toilet means fewer troubles for you and your health. One of the reasons the toilet is always clean is its forceful flush, provided by a G-max system. It includes an extra-wide 3” flush valve combined with a 21/8” trap way. In addition, the system comes with a powerful siphon jet, which makes the water get into the toilet more quickly and forcefully with all these parts combined. The powerful water flow prevents the unit from being clogged. The unit is very thrifty with water, using only 1.6 GPF. Some of the sub-models are even more efficient, they use 1.28 GPF. If you compare this number to the older models, you can count the money you’ll save per year. The former toilets used 5 or more gallons per flush. Also, the flushing process is quiet and the tank fills very fast. All of us know how the slamming seat sounds and which reaction it usually causes. That problem is none of concern anymore, the hinge slows down the seat, so you won’t be horrified with the noise. The SanaGloss option is a special ceramic coating that helps the materials go down faster and leave no residue. 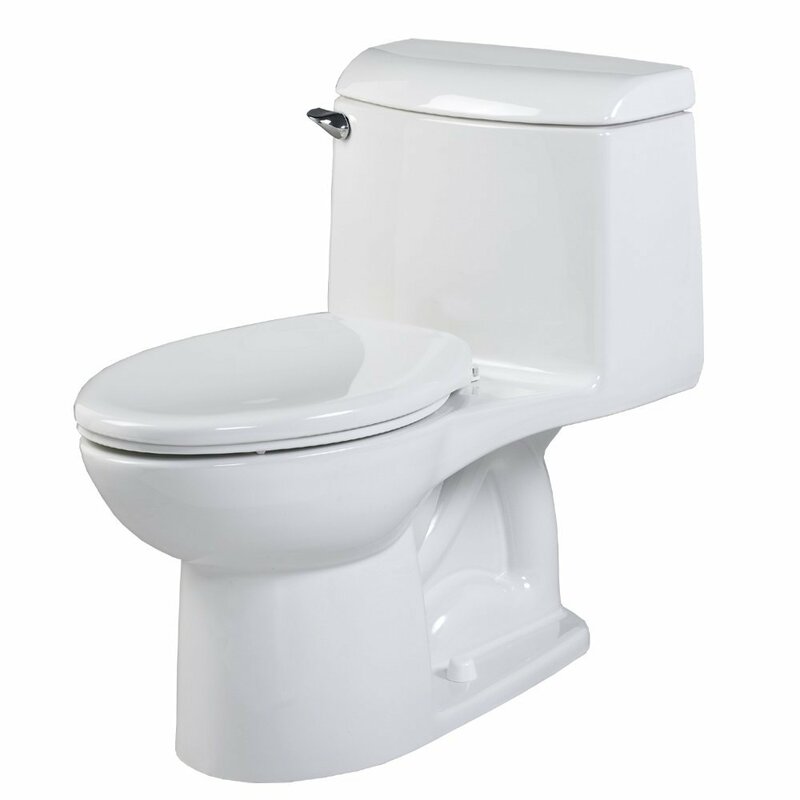 Any toilet that is not taken care of accumulates bacteria and mold over time. The SanaGloss system slows this process. The surface of the bowl becomes more resistant to the natural growth. This model has an ADA-compliant height, which can be a great help for the elderly and the infirm. Those people may have difficulties with getting up or sitting down. The high unit can make the things easier for them. The unit comes with a so-called E-Max system. It uses only 1.28 GPF instead of 1.6 GPF. There are some variations of this sub-model. The MS854114EG comes with a SanaGloss coating, the MS854114EL offers the ADA-complaint height, and the MS854114ELR has the trip lever on its right side. 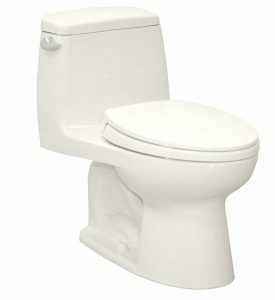 Practically, it is the same model of a toilet, just comes with a traditional round bowl. The eco Ultramax MS853113E is another variation of it that uses 1.28 GPF (the efficient version). Both the MS854114 and the MS853113 models include the whole variety of functions and features that will satisfy any user in particular. All of them come in a number of colors: Cotton white (01), Colonial white (11), Sedona Beige (12), and Bone (03). The whole line represents the quality and the benefits of the one-piece unit system.